When it comes to smartphones, our expectations have some commonalities to them regardless of if we're talking about a top-of-the-line flagship, or the most affordable budget model you can find. While we're happy to settle for less in the case of the latter, we still start out hoping to get a _phone_ with a pleasing-to-view display, a capable camera, decent app performance, and ideally some day-long battery life. And no matter how fancy the _phone_ we're talking about, we still expect to find standards like Wi-Fi connectivity, motion sensors, and Bluetooth. For most smartwatches, being able to clearly see the wearable's output in a variety of lighting conditions can prove pretty challenging. But with no digital screen, the Phase manages to dodge that bullet – or does it? The watch's hands are made of a shiny chromed-out material, helping to catch the light even as it's fading and still let you read the time. But once ambient light is gone, you're on your own, as there's no built-in illumination to be found: no side-light, no back-light – nothing. 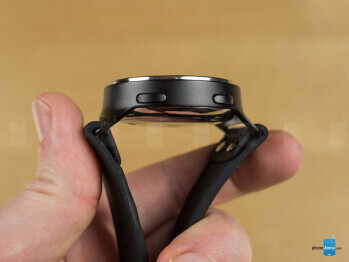 While that's somewhat understandable, the slightly more frustrating situation concerns that notification circle at the bottom of the watch's face. Normally black, it changes colors to indicate the type of notification hitting your phone – maybe yellow for a call, or blue for Twitter. 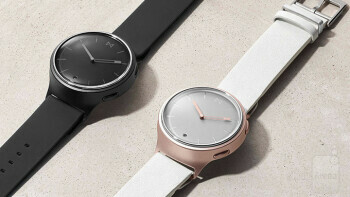 And while the watch lacks a speaker, a vibration motor gives your wrist a gentle buzz to let you know when to glance at that circle to see what kind of notification is incoming. 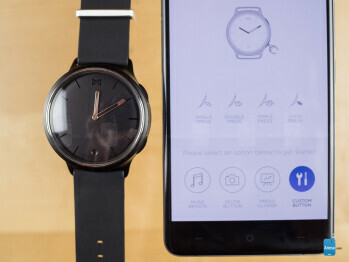 If you were designing a hybrid smartwatch, how would you engineer that feature? A multi-color LED sure sounds like the obvious answer, but that's not what Misfit went with here. Instead, there's a physical wheel of colors that turns to display the correct one through that tiny circular window. It's not unlike the date-display on an analog wristwatch, except instead of the disk being printed with the numbers 1-31, it's sectioned off into multiple colors. The first problem there is that the lack of illumination can make those colors quite hard to see – and if you're using the watch in the dark, forget about checking your notifications entirely. 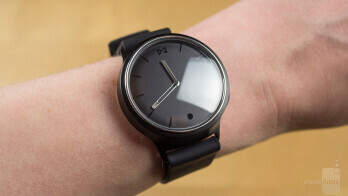 This may sound like a blessing if you've ever found yourself distracted during a show or a movie where other patrons in the darkened theater were wearing typical smartwatches, and the incessant twinkle of lights on their wrists proved a nuisance – but it still limits the Phase's usefulness. The poor visibility of the notification window is compounded by a second problem: the Misfit Phase doesn't display notifications for long. Once you feel that buzz, you've got about three seconds to raise your wrist and peek at the window before it returns to its default black. If you've got your hands in your pockets, or are even remotely preoccupied with another task, that's a precious short amount of time in which to check the watch's face. With all that said, we do have to point out that the authenticity of this mechanical notification mechanism does a lot to keep the style of the Misfit Phase firmly placed within the analog watch domain, as opposed to having a blinking light. 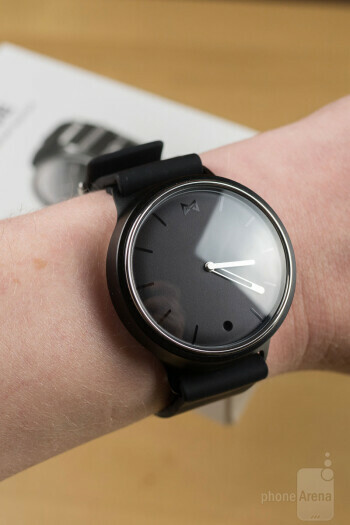 And with some tweaking to the implementation, Misfit should also be able to turn this into a more useful tool as well. To get started with the Misfit Phase, you're going to have to download the Misfit app. 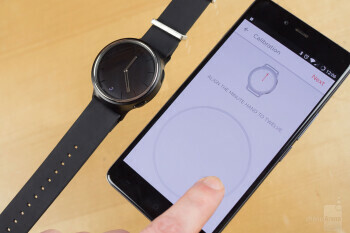 The same app works with all the company's wearables, and is available for both iOS and Android devices. 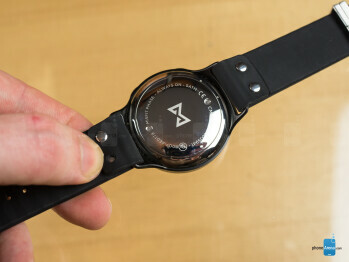 Once installed, connecting the Phase to the app is easy enough: the watch's top button puts it into Bluetooth discovery mode, and then it's just a simple matter of pairing the device with your phone. The app asks for your name and some basic physical info in order to calibrate its algorithms for computing calories burned. While general device compatibility is good, there does seem to be an issue with app compatibility when it comes to the delivery of notifications. Say you're a Google Voice user, and you prefer to get your messages through the Voice app itself, rather than sent to your phone as standard SMS. While the latter would work just fine with the Phase's notifications, the app only lets you configure notifications from a subset of the installed apps on your phone – and you guessed it: Voice is not among them. Without a touchscreen, and with only limited button controls, there's not a whole lot of interaction to work with on the Misfit Phase itself. Your one avenue for exploration here is the watch's bottom button, which can be configured through the Misfit app to accomplish a number of tasks. The software's pre-configured to offer you three modes by which to use that button, each taking advantage of single, double, triple, and long-presses to perform different actions. In music mode those control basic playback options, but we're talking seriously basic: in the default setup, there's volume-up, but no volume-down (which you can later add, but at the expense of another option). Camera controls let you snap a single shot or a burst of several, and presentation controls let you move back and forth through slides on your connected device. By far, the most flexible mode is a custom layout that lets you not just assign any of those functions to whichever button pattern you choose, but also activate a ring-to-locate feature for your phone, or even trigger select apps and services – with IFTTT looking like the most powerful there. While we're talking about options present in the Misfit app, some are a lot more useful than others. For instance, there's a “Find my Phase” button that claims to help you locate a missing watch (that's still within Bluetooth range), but falls short of accomplishing even that simple task. 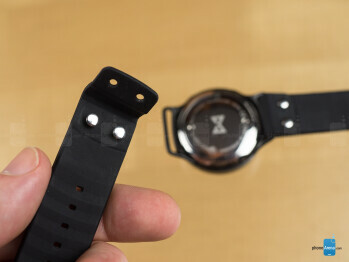 Despite the presence of a vibration motor for notifications, the watch-location option entirely ignores this hardware. Instead, it spins the watch's hands and twirls the color wheel – for all of two-and-a-half seconds, and completely silently. How this is in any way useful, we've yet to figure out. Like all its other features, the Misfit Phase keeps its fitness-tracking abilities pretty toned-down, but they're indeed present. As we mentioned earlier, there's no heart-rate-monitoring capabilities, but you still get basic step-counting – as well as all the associated data (like calories burned) that can be extrapolated from that. After synching with your phone, all that info is accessible through the Misfit app, giving you a look at your activity throughout the day, and offering you the opportunity to tell the software a little more about what you were up to – by spelling out the difference between time spent walking, running, dancing, or being involved in a number of sports, the app's better able to provide feedback about all this activity's impact on your health. While all that sounds very involved, Misfit simplifies the way it displays your progress towards fitness goals, breaking things down into a convenient points-goal for each day. At night, the Phase will also track your sleep. And if you happen to have some buddies who are also wearing Misfit products, you can share your fitness progress with them through the app's social component. If you'd rather chart your data through a system-wide fitness hub, Misfit supports sharing its info with Google Fit and Apple Health, among others. Finally, if you just need a little reminder now and then to get off your feet and move around a little, the Phase offers a mode that detects when you've been sitting still for too long and reminds you to get active. You can manually set start and stop times for this feature, so you're not being pestered while trying to catch some sleep. So far, the Misfit Phase might sound like it doesn't offer a lot compared to other wearables, but it's yet to play its trump card: battery endurance. Your typical full-featured smartwatch probably needs to be recharged every day or two, while a smaller fitness tracker might run through its battery over the course of a week. But the Misfit Phase doesn't get recharged every day, nor even every week. Actually, it doesn't get recharged at all. 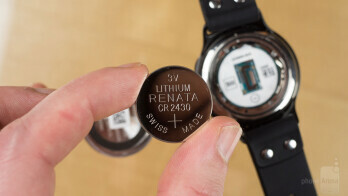 The wearable's powered by a consumable lithium coin-cell battery that Misift says should last about six months under typical usage – get a ton of notifications, and that figure could come in a bit lower. New ones are affordable enough, and especially if you stock up with a multi-pack, should only run you a buck or two each. The slightly more worrisome issue is actually getting at the battery. As we mentioned earlier, the Phase's back is marked with a pair of contact points, and you'll align these with an included tool to unscrew the battery compartment. While that may be a usability compromise between a battery you'd need to be a jeweler to replace, and one covered by a big, ugly slot you'd need a quarter to unscrew, we can't help but be a little worried that six months down the line, we won't be able to find that tool when we need it – and suddenly an easily user-replaceable battery becomes a much bigger headache. By exercising some care, though, such situations can be easily avoided. 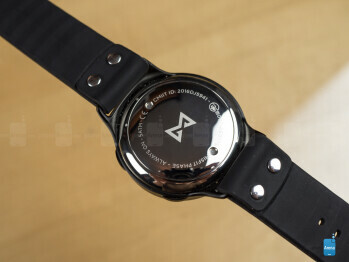 While that laser-focused feature set can be appealing in the right light, it's also a little frustrating to see tied to a price tag as high as the Phase's is: pricing starts at $175, and pairing the watch with a leather strap pushes that figure up to $195. 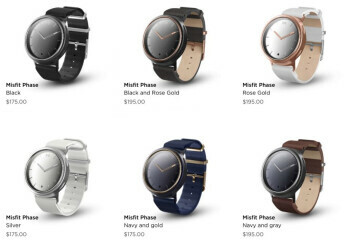 That's a heck of a lot more than many fitness trackers that offer similar, if not even expanded functionality. 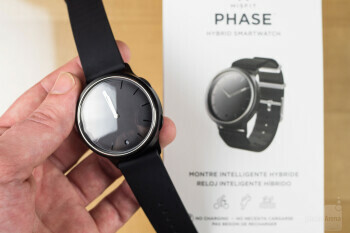 So Misfit seems to be charging a premium for a connected device that doesn't really look like a connected device. That could be a pretty compelling pitch, but the execution of the Phase just falls a little short of where we'd like it to be. Maybe the biggest negative is that it's just entirely too thick for what it is and what it does; with these capabilities, we'd want to see a far more slender wearable. 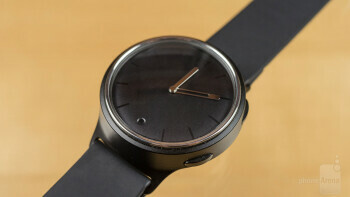 And if your big selling point is traditional watch look-and-feel, your product needs to be built like one, too. Beyond that, the poor low-light performance is another tough spot to get past. The non-illuminated notification window is a questionable design decision, and it severely impacts the wearable's usefulness. 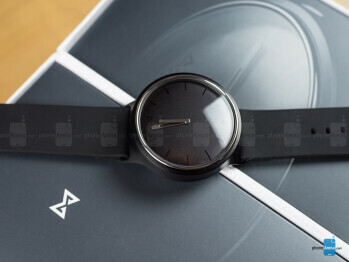 At closer to $125, the Misfit Phase would be a much easier sell, but at these prices we'd definitely want to consider alternatives that either offer more functionality, or simply look a little more attractive, like Fossil's Q-series of hybrid watches, or the Skagen Hagen smartwatches.